Underwater noise – the challenge: To use the marine environment whilst respecting and protecting marine life. Human activity at sea is largely essential to global economic development, but increases the pressure on marine ecosystems. From the 1980s onwards, once a correlation had been made between sonar exercises and numerous whale beachings, the scientific community started to express concerns and to research the potential prejudicial effects of anthropogenic noise on marine life. These concerns now influence public opinion and political decision-makers and have resulted in related national and international regulations. In Europe, regulation is currently governed by two European Directives, the Water Framework Directive (2000) and the Marine Strategy Framework Directive (2010). 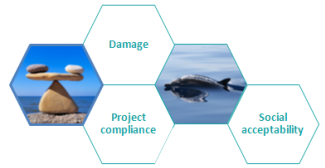 From now on, all new marine projects are covered by the new regulations, and manufacturers must evaluate the environmental impact of a project’s underwater noise impact. Complying with the new regulations significantly increases the chances of success in acquiring public development permissions and consents and contributes to a project’s public acceptance.